Under the auspices of the Glasnevin Trust, Armistice Day Commemorations were conducted in Glasnevin Cemetery Dublin, on Friday 11 November. The commemorations included an Ecumenical Service in the Church of the Resurrection, a Parade to the Cross of Sacrifice, the Unveiling of Victory Cross Commemorative Plaques and a Wreath Laying Ceremony. 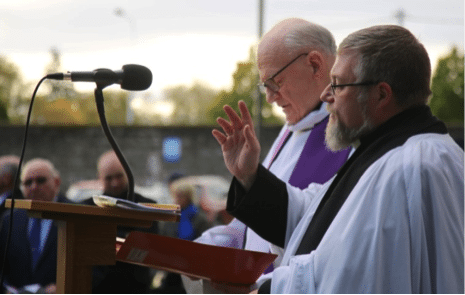 The Service was conducted by Reverend David Oxley and Fr Barney McGuckian. In Flanders Field was read by H.E. Robin Barnett CMG the British Ambassador to Ireland. Professor Peter Harbison read a Reading from the Revelation to John. The Ode of Remembrance and the Kohima Epitaph was delivered by Major-General The O’Morchoe. Music was provided on the uilleann pipes by Eamonn Walsh. Mr John Green, Chairman of the Glasnevin Trust, led the proceedings at the Cross of Sacrifice. Following an Ecumenical Blessing by Reverend David Oxley and Fr Barney McGuckian, H.E. Robin Barnett CMG accompanied by the Lord Lieutenant for Belfast Mrs Finnuala Jay-O’Boyle CBE unveiled four Victoria Cross Commemorative Plagues. The Plaques were in honour of four Irish men who received the Victoria Cross for their bravery in the First World War: Lieutenant John Vincent Holland VC, Sergeant Martin O’Mara VC, Private Thomas Hughes VC and Corporal Frederick Edwards VC. Those laying wreaths at the Cross of Sacrifice included Councillor Brendan Carr, Lord Mayor of Dublin; Minister for Public Expenditure and Reform, Paschal Donohoe TD; John Green, Chairman of the Glasnevin Trust; Mrs. Fionnuala Jay-O’Boyle CBE, Lord Lieutenant of Belfast; H.E. Robin Barnett CMG, British Ambassador to Ireland; H.E. Kevin F. O’Malley, US Ambassador to Ireland, H.E. Kevin M. Vickers, Canadian Ambassador to Ireland; H.E. Richard Andrews, Australian Ambassador to Ireland; H.E. Thomas Nader, Austrian Ambassador to Ireland; H.E. Philippe Roland, Belgian Ambassador to Ireland; H.E. Matthias Hopfner German Ambassador, Mr. Alan McCarthy, Honorary Consul General, New Zealand Embassy, Major-General The O’Morchoe President Royal British Legion, Ms Catherine Lawson, CWGC Head of Marketing and Communications; and representatives of the families of the Victoria Cross recipients, the Irish Guards Association and students of Clongowes Wood College. The ceremony concluded with the rendering of The Last Post, The Silence, followed by the sounding of Reveille by a bugler from St James’s Brass and Reed Band. The Military Heritage of Ireland Trust was represented by its Chairman Brigadier-General Paul Pakenham (Retd). After the ceremony the Minister for Public Expenditure and Reform, Paschal Donohoe TD, said, inter alia: “I am honoured once again to have the opportunity to partake in the Armistice Day Commemoration, during which wreaths are laid in memory of the many Irish men and women who gave their lives during World War One. The sacrifices made, and the bravery shown, by them is remembered with pride and admiration. Hearing the stories of those whose plaques are being unveiled also brings real life to proceedings and gives us a sense, and an understanding, of the courageousness and selflessness of those we commemorate here today. Chairman of the Glasnevin Trust, John Green, said inter alia: ‘The Cross of Sacrifice under which we laid these commemorative wreaths this morning is a lasting tribute to the Irish men and women who fought in World War 1 and the enormous sacrifices they made, in the case of tens of thousands it was the ultimate sacrifice.